The winter of 2016–17 was “devastating” in Walla Walla, Washington: day after day of temperatures rarely going above 20 degrees, winds gusting at more than 50 miles per hour, and repeated dumps of snow. The city’s relatively new homeless camp did not fare well. Tents collapsed or tore, and volunteers from the Walla Walla Alliance for the Homeless struggled to help the residents keep their bedding and clothes dry—to keep people alive. What’s more, the volunteers had no support from the city to make or enforce rules or to provide even a basic amount of safety and security in the camp. “Chaos,” “absolute mess,” “out of control,” “jungle” “like something in Afghanistan or Syria,” are the terms they used to describe it. “That people didn’t die is amazing,” says Assistant City Manager Byron Olson. “We weren’t going to do another winter like that,” says Alliance volunteer Craig Volwiler. The city needed the Alliance because no one else was willing to manage the camp. The Alliance needed the city to provide a site, infrastructure, and support for enforceable rules. Negotiations about a new camp at a new location began even before last winter ended. Those negotiations, which involved city engineers, police, parks and recreation, the city manager’s office, and the city attorney were often frustrating for Alliance members because the city was reluctant to support the sort of camp that the volunteers believed could succeed. During one of those sessions, Alliance board chair Chuck Hindman said if the city agreed to a more permanent camp site managed by the Alliance, the volunteer group could build 20 Conestoga Huts for it, according to Volwiler, who was at that meeting. The Alliance had not discussed making that sort of commitment. The Alliance first heard about Conestoga Huts and Community Supported Shelters when Dan Bryant, pastor of Eugene’s First Christian Church and one of the driving forces behind Opportunity Village, spoke in Walla Walla in April 2016. One of the Alliance’s first initiatives was Madison Park, a tiny house project similar to Opportunity Village. That project was eventually scrapped because of neighborhood opposition and the city piling on so many stipulations to its zoning approval that it became financially infeasible. The situation for the homeless in Walla Walla, a city of about 32,000 in southeastern Washington, dramatically changed in 2016, when the city passed an ordinance that made it illegal to sleep in public places. That law was a response to downtown merchants worried that people sleeping in doorways could hurt the burgeoning flow of summer tourists, attracted by a flourishing small-vineyard wine industry. Management of the camp fell to the Alliance. “No one asked us to do it. [But] no one else was going to step in and do it,” Volwiler says. They tried to implement some of the practices they had learned about from the CSS Safe Spots: a set of rules, self-management among the campers, regular community meetings. But none of that worked. The Alliance volunteers had no control over who came into the camp. To serve the purpose of off-setting the public sleeping ban, they had to let everybody in. And, for the same reasons, they had no power to kick anybody out. They were allowed to manage the front gate, but the fire marshal insisted on an unlocked back gate—out of sight of the front gate. There was no overnight management at all. What Craig Volwiler did when faced with the impossible task of a group of older men and women volunteers building 30 Conestoga Huts was to take charge. The Huts appealed to the Alliance because of their size and greater durability than tents. They could be built by volunteers, which was the only way the Alliance was going to get it done. And the materials were affordable. The Alliance had just about enough money left in its coffers from the Madison Park project to buy the materials to build 30 Huts. After a conversation with Erik de Buhr, CSS director of programs and designer of the Hut, Volwiler made a one-day trip to Eugene in late winter of last year, on a day when a scheduled Hut build was cancelled because of bad weather. But he saw a completed Hut and most of the components in the shop and heard about the Hut construction manual, which was then in the final stages of revisions and proofreading. Volwiler told de Buhr he couldn’t wait for the manual to be completed. He needed it right then. Walla Walla city officials, he thought, didn’t really understand the Huts from photographs. “We decided we had to build one and put it on a trailer and haul it to city hall and show them”—similar to what CSS had done in 2012 when it was trying to persuade the Eugene City Council to include Huts in the car camping program. He convinced de Buhr to send him a PDF of the near-complete manual. He built a Hut at his house and presented it to the city. In the process, he became the first tester of the manual to see if its lists and diagrams and step-by-step instructions could actually show someone who had never built a Hut how to do it. It did. “The manual was fantastic,” he says. And Volwiler found a few things—several typos, a tool not included, a measurement that didn’t work—that could be corrected before the manual went to print. “Night and day does not adequately cover” the difference between the old camp and the new camp, says Olson, the assistant city manager, at a meeting in early February when de Buhr made a visit to Walla Walla—just less than a year after Volwiler had come to Eugene—to see what the Alliance volunteers had done and to exchange information. The new camp, called the Sleep Center, sits on a slice of city property, behind a public works building in a warehouse neighborhood north of the city center. The 31 Huts (the one Volwiler built as the demo, plus the 30 that the volunteers did get built), one small tent on a platform, a big tent with a propane heater for overflow clients, a gate house, and a reception booth form an elongated rectangular O with not much room to spare. Olson and some others involved with the Sleep Center are careful not to use huts when talking about the CSS-inspired shelters. It sounds a little too close to home for some of the Walla Walla bureaucracy. A point of concern for the city attorney was that the Conestogas—as they are most often referred to in Walla Walla, though the label “hard-sided tent” is also used—were too close to a “domicile” structure, which could expose the city to lawsuits. 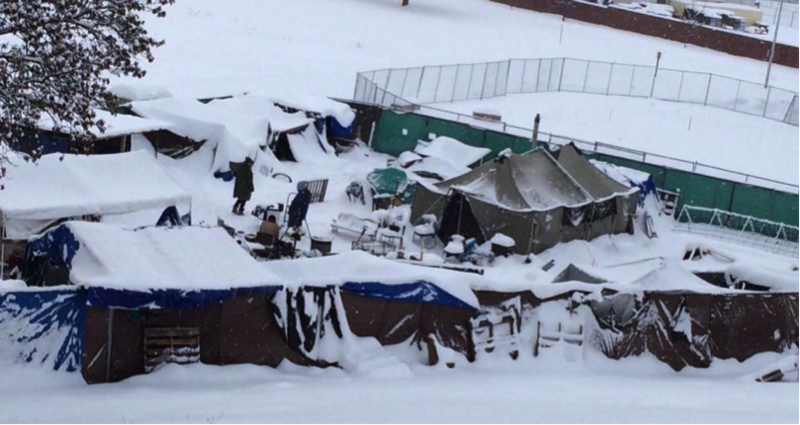 The Conestogas can’t have electricity or heat, and the camp can’t have plumbing or cooking facilities and can only be open during nighttime sleeping hours. Whatever you call them, building 30 in a few months in the 100-degree heat of a Walla Walla summer “almost killed” Volwiler. He finished the project with serious numbness in his right hand and problems with both knees and hip joints, but perhaps fared better than Hindman, who broke his arm in a fall during the installation of Hut 22. Volwiler had ordered two copies of the finished manual (How to Build a Conestoga Hut) and, after a somewhat slow start, he and his dozen regular volunteers were building and installing four Huts a week, working four hours a day, Wednesday through Saturday mornings. Other community groups also pitched in. All the Huts were installed at the camp by the end of September. 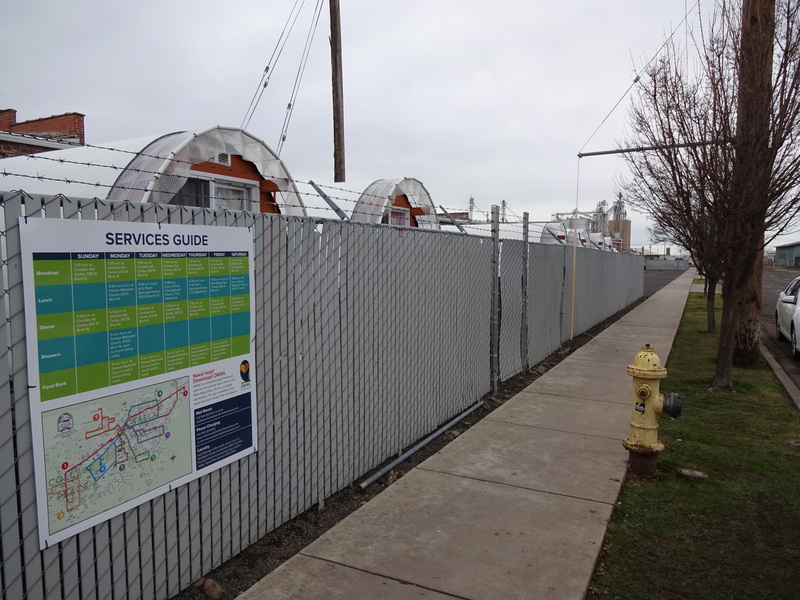 By comparison, CSS in Eugene has built and installed a little over 70 Huts since 2013. 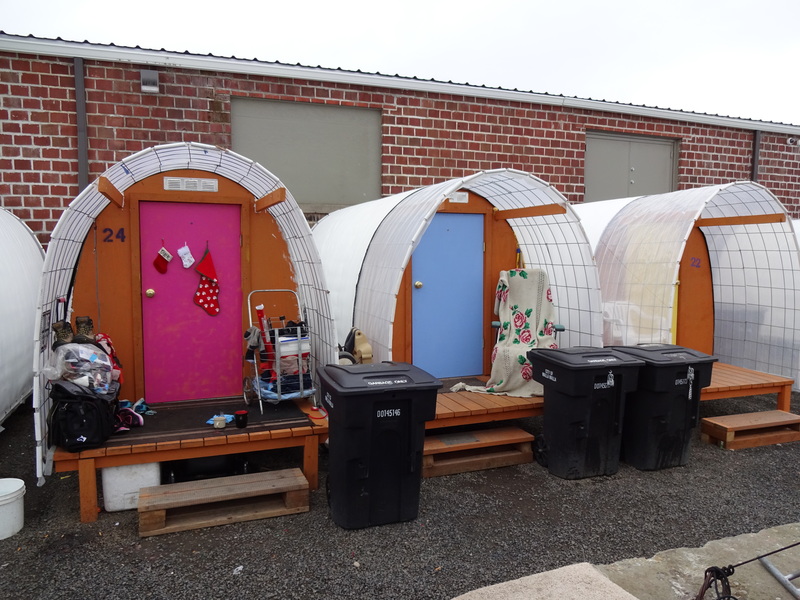 The 31-Hut camp in Walla Walla is the largest concentration of Huts anywhere. 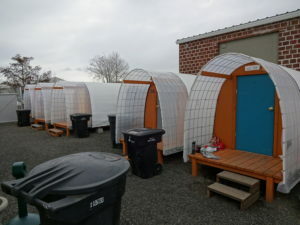 The Sleep Center had actually opened last May with tents on platforms built by Walla Walla Community College carpentry students to Volwiler’s specifications to eventually serve as the floors for the Huts. They faced a hard deadline to close down the old camp. The city was opening a new multi-million swimming pool nearby on Memorial Day. They wanted the camp gone by then. The final site of the camp was the fourth one proposed. Other potential locations faced intense public opposition. The public works site had only city employees and neighboring businesses to contend with, and they finally accepted a one-year trial. The Alliance had hoped for a camp more closely modeled on CSS Safe Spots, “a transitional housing model where a client would be assigned a Hut and be expected to treat it like a home, using it as a foundation to begin to rebuild their lives,” in Volwiler words. But it came down, just weeks before the old camp was to be razed, to either accepting the city’s Sleep Center model or walking away. Alliance volunteers were split on that decision, but reluctance to leave the homeless people served by the camp without support ultimately led them to accept the city’s terms. Under a dusk sky on a mild winter evening, de Buhr toured the Sleep Center with Volwiler, Hindman, and Peter Brick, a paid part-time manager. The folks who sleep in the Huts were beginning to trickle in. They can check in from 4 p.m. (during the winter, later in warm months) to 10 p.m. and have to be out by 9 a.m. the next morning. They can return to the same Hut, but they can’t leave any of their personal belonging in it. The camp provides locking storage bins for their possessions. If a person does not return for three days, the Hut is considered vacated and open to anyone. At the west end of the camp, five Huts are lined in a row, just two feet apart. Campers sat on the front decks, drinking hot chocolates, one of the few refreshments the volunteers can offer them. Community groups, though, often bring complete meals for the whole camp, though none had come so far that evening. Jason, a 30-something man with a big smile who has been in the camp for a few weeks, shook de Buhr’s hand. “This structure is awesome. It feels like a home to me,” he said. Later he asked de Buhr for his autograph. De Buhr and Volwiler looked closely at the Hut construction. The outermost roof/wall layer should have been a bit longer. 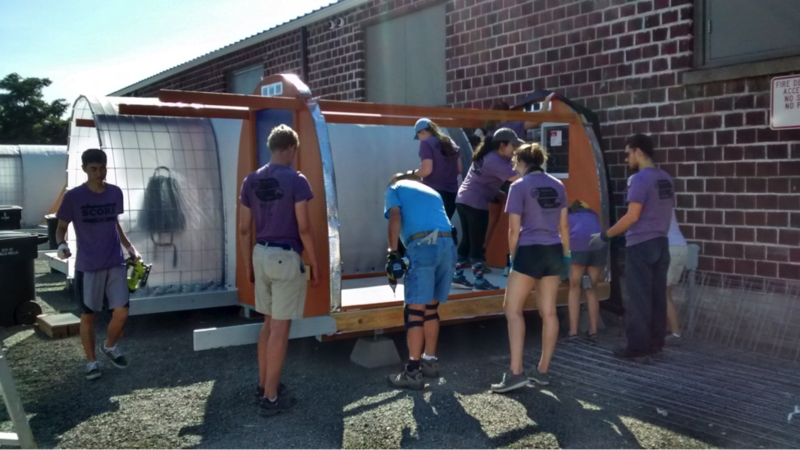 Volwiler mentioned that some of the campers attempted to lessen moisture accumulation inside the Huts by blocking the vents on the end walls—which would have the opposite effect and increase moisture buildup. The Walla Walla hut crew’s method of lining up the fence panels used to form the roof and side walls might be an improvement on how the Eugene crew has done it. Since its beginning, the Hut design and building process has evolved. The Walla Walla experience adds a whole new dimension to that evolution. In addition to Brick, the camp is managed by Alliance volunteers. On the evening of de Buhr’s visit, Jan Foster and Kathy Drake greeted clients as they came through the gate, checking in with them before they head into the registration booth to get signed in by Grace Bryant. It’s a bigger crew than usual because of the visitors, but at least two people are always on duty until 10, when a security guard paid by the city comes on duty for the night. Foster, known as Granny to the campers, volunteers four hours a night, seven days a week. As the incoming residents and the volunteers clustered between the gate and the registration booth, Bill, a tall gregarious camper, reported that city police have been “beating the bushes,” seizing property left there by homeless people, and turning off outlets at the city’s transit center where folks could charge their phones. The camp, which usually has around 35 people (including couples) in its 32 shelter spaces, was not quite full. If the camp were full, then people outside the camp could not be arrested for sleeping in public places. The city has designated specific places where they should go, but there is some confusion about exactly where those are, both among the volunteers and the clients. The city did establish rules for the camp, though in some cases they went beyond what the Alliance asked for and can reasonably enforce (like a prohibition on sexual activities behind the closed doors of the Huts). Hindman has translated the two-page legalistic document the city attorney approved to a practical one-page guide. The Alliance does now have the power to “trespass”—evict—clients for up to three days for rules violations, and about 10 people are on a “never-admit” list for past transgressions. Beyond that, the Sleep Center is required to accept anyone who shows up. Their clients are people who can’t or won’t get help through the Christian Alliance (similar to Eugene’s Mission), the nearby Veterans Administration Medical Center, or other programs. Some refer to them as “the bottom of the barrel,” those most likely to be facing significant substance abuse or mental health issues. While in Walla Walla, besides meeting with camp volunteers and clients and Assistant City Manager Olson, de Buhr met with a Monday morning group representing churches and organizations serving the homeless and Alliance volunteers who have just started a pilot program called Exit Homelessness, a more intensive approach to “case management” than CSS’s Action Plan Advisors. 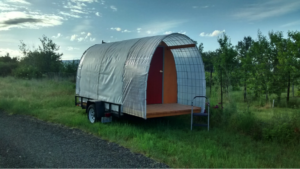 Folks in Walla Walla were particularly interested in Eugene’s car camping program and the Safe Spot’s self-management, community building, and handling of limited stays. It was apparent in the engaged conversations during de Buhr’s visit that volunteers and communities serving the homeless can learn much from each other, that we face many of the same problems. The Exit Homelessness volunteers suggested the CSS look into innovative programs for the homeless being tried in Yakima, Washington, and de Buhr told them that CSS is working on a collaborative effort with folks in Tacoma. Assistant City Manager Olson said it was important to dispel common myths about homelessness, which seem to exist everywhere, most notably that the homeless come from someplace else (80-85 percent of Walla Wall homeless are “homegrown,” he says) and that homelessness can be cured, like polio was with a vaccination. We lack the resources to take care of everyone with significant mental health issues, he says, and “we are going to have homeless vets, as long as we . . ,” his voice trailed off. “ . . . Go to war,” someone else finished his sentence. Olson’s son served three tours of duty in Iraq and Afghanistan. “This is not a problem that is going to go away or disappear,” Olson says. [6 p.m.] . . . And AB, for no reason anybody can fetch, tears a strip off Nancy for housing all the shitheads down there in his vicinity. Completely gratuitous rudeness, which in addition scares young C. I know what’s working AB’s squeejaw: his housing search has failed yet again, and his voucher extension lapses on the twenty-third of this month. After that, he’ll have no chance at all, having no steady income. [8 p.m.] . . . Nancy says that DE cleaned the whole parking strip of dog poop this afternoon. DE does not even own a dog. Piling up treasure in heaven, that guy; also, the highest recommendations from Sleep Center volunteers, if such should ever have any value in his housing search. [9:58 p.m.] J gives me a book he picked up at the Just Right closeout: The Perfect Horse. Combination of horses and history neither of us can resist; he knows I’ll hand it back when I’ve read it. A good indication of the more than night-and-day difference from the old camp to the new are the last entries from Foster’s log on several nights about a year apart. 27 January 2017, 9:50 p.m.: I go home, hoping not to hear fire engines in the night. 1 February 2017, 10 p.m: Just as I am leaving, a furious fight breaks out between C and D . . . K is waiting at the gate to walk me to my car. He shakes his head. 4 February 2017, 10:15 p.m.: K brings the three axes and hatchets into the office tent just in case. 29 January 2018, 10:10 p.m.: All quiet as I go home. 2 February 2018, 10 p.m.: All quiet as Peter and I go home. We are a 501(c)(3) organization and you may take a tax deduction to the full extent allowed by law for your contribution to us. The growing houseless population can be a challenge which brings us all together to make a difference and create a highly efficient, solution-based program supported by the whole community. CSS’s Monthly eNewsletter is the ultimate way to stay connected to our growing community of supporters, partners, and recipients!